I’ve been enjoying picclick.com. It’s a shame they don’t have a UK site (but they’re working on it) and I’d hardly call it perfect (some of the image quality is shabby) but it’s a fun way of dicing/slicing/enhancing the eBay search experience. 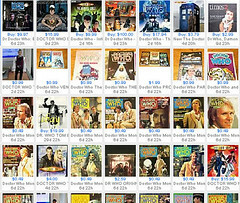 Here’s a search I did for Dr Who items that kept me absorbed in a way that eBay’s own search hasn’t done for ages. Whilst it’s great that a pictorial search has been developed by picclick (and I’m keen on any innovative developments that make finding items more easily): why isn’t eBay rushing out something similar and better? Etsy is definitely the marketplace leader in this field. Looks pretty much like eBay’s window shopping, no?